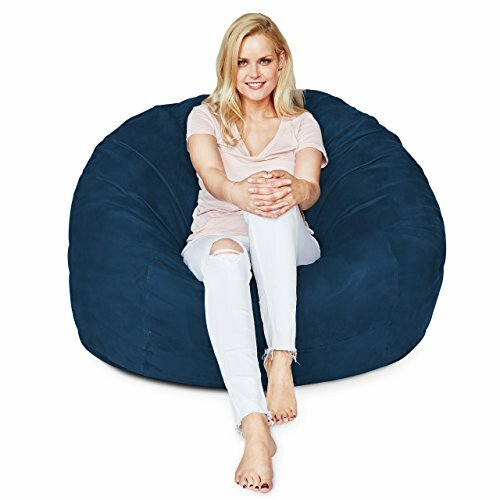 The Lumaland Luxury Bean Bag Chair is a real Big Size Sofa. A 4-foot lounger to fit all kinds of living rooms, bedrooms or children`s rooms. Enjoy great everyday fun and relaxation in all situations. So take your time and lean back with your friends and family. The ultra soft and machine washable microsuede outer covering has a great touch and feel - perfect for kids, teens and adults. And you can still use your lounge chair with the beige polyester inner cover during washing - so its a 2 in 1 lounger that can be used all the time even when the outer covering is in the washing machine. For long lasting coziness and soft comfort our bag inner covers are filled with high-class foam material, without any plastic parts or remnants. The foam reflects your body heat and provides absolute well-being. Get ready for a new style of modern furniture in your home. The deep colours and different sizes of the Big Size Sofa are perfectly mixed so you can choose the best bean bag for your own preferences. The microsuede cover is designed for daily use by children, adults and pets - Your new Sofa Sack becomes the new focus in your apartment. The maintenance is easy to handle by zippers - just put the outer cover in your washing machine or simply use a cloth with warm water and mild cleanser. Remember there is an inner cover in the lounger so you can use your lounge chair all the time. Your Bean Bag will be shipped in a box with a fraction of its size and expands to full size within three days. But you can fluff it up and crush any clusters to support and accelerate this process. Lumaland Luxury Bean Bag Chair with ultra soft and machine washable microsuede outer cover. Great touch and feel for kids, teens and adults, with beige polyester inner cover - so you can still use your lounge chair during washing. A real Big Size Sofa - 4-foot lounger to fit all kinds of living rooms, bedrooms or children`s rooms. For great everyday fun and relaxation in all situations. So take your time and lean back. For long lasting coziness and soft comfort our bag inner covers are filled with high-class foam material without any plastic parts or remnants. The foam reflects your body heat and provides absolute well-being. If you have any questions about this product by Lumaland, contact us by completing and submitting the form below. If you are looking for a specif part number, please include it with your message.